IHN is a national organization that provides housing and support programs for homeless families. 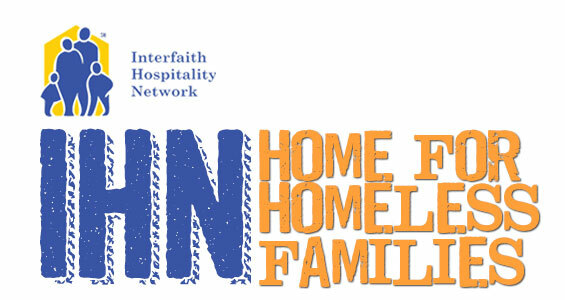 While searching for permanent housing, families stay in participating churches for a week at a time. PPPC hosts families from IHN four to five times a year. Host churches have opportunities to minister to the families in a variety of ways and often times those doing the serving (us) find themselves being blessed in return. There are several ways in which to become involved with IHN. HOSTS: Hosts are those who come and spend time with the families in the evening to make them feel welcome. Some hosts may help kids with homework and play with the children to give the parent(s) a break. ITEM DONATIONS: Individually wrapped snacks and small single serve cereal boxes can be dropped of in the basket in the Narthex. The families are provided a simple continental breakfast each morning as well as items for them to pack their own lunch for school and work. ADDITIONAL NEEDS: In addition to these ministries, we need people to do laundry once the families have left. That involves taking a pillow case full of dirty sheets home to wash; returning them clean and folded.